ChBE Graduate Student Curtisha Travis. 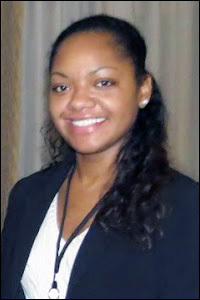 Department of Chemical and Biomolecular Engineering (ChBE) graduate student Curtisha Travis was presented with the American Institute of Chemical Engineers’ (AIChE) Computing and Systems Technology (CAST) Directors’ Award at the society’s annual meeting late last year. The award recognizes the division’s best poster as selected by CAST's directors. Travis, advised by ChBE and Institute for Systems Research professor Ray Adomaitis, was recognized for her presentation of “The Computational Challenges of Simulating Atomic Layer Deposition (ALD) Process Dynamics.” The poster described a model that predicts the optimal conditions for atomic layer deposition of alumina when using water and trimethylaluminum (TMA) as precursors. Travis’ work is supported by the NASA Goddard Space Flight Center, the National Science Foundation through grant CBET-0828410, and the Gates Millennium Scholarship fund.